I love riding my old Dutch bicycle. It is a pleasure to ride along the river and fields before going to work and returning home. But in summer I begin sweating, especially at my back, where I am carrying my rucksack. Some of the other bicycle riders are using standard panniers or those waterproof ones. 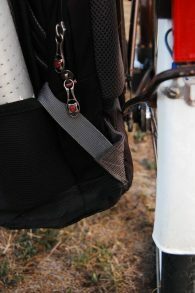 “Mhhm … buying a pannier that I am bonded to use just for a bicycle, but that I cannot wear as comfortable as a backpack? 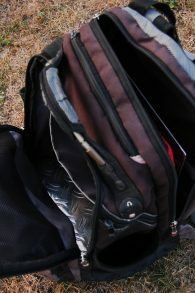 I already have I backpack that I am used to go through the day – so why do I need something else?” That’s what I thought. So I built a first bracket out of a coat hanger’s wire and attached it to the carrier. I easily could hook my rucksack to the bracket and arrive at work without too much sweat. After the first prototype has worked sufficiently, I launched Fusion 360 and designed the hereby presented Bicycle Backpack Bracket. I looks a lot better, has smoother edges that don’t wear out the backpack’s handle too fast and is surprisingly strong, though I have printed it with an infill of maybe 50% and five shells for the vertical perimeters. As the printing filament I used ABS. It is a simple system that can be installed and removed quickly without tools. 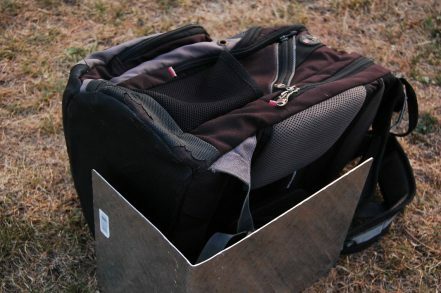 If the back of the rucksack is not so stable or the front lowers due to the weight of heavy books, you can buy a sheet of aluminum and bend one side by 90°. Insert the sheet inside the backpack and as a result it is a lot sturdier and does also not tip over when placed on the ground. 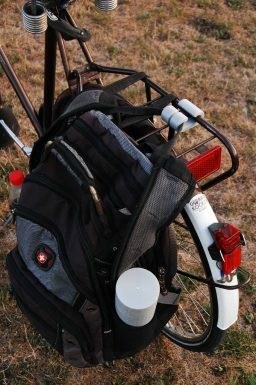 Sometimes, the back rubs at the bicycle’s tire, so maybe I will add a simple spacer between rucksack and bike. 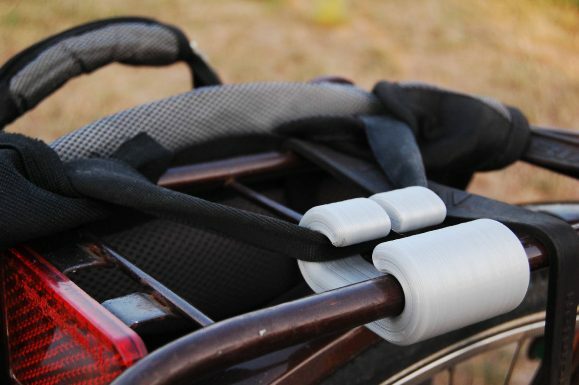 I hope you can benefit by this bracket and enjoy the breeze at your back while riding your bike!